UPDATE: Police now have control of the concert hall where gunmen were holding hostages. Three gunmen dead from concert hall and police report at least 100 people dead. 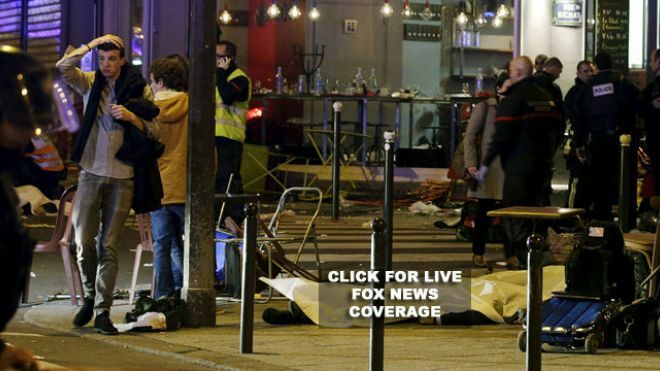 Paris police report at least 40 others killed in other areas. Reports that gunmen threw grenades at concert goes. There are now four confirmed areas of attacks. The stadium, a restaurant, the concert hall, and a shopping area. It appears that the three suicide bombers at the stadium are dead. Three gunmen at the stadium are dead, but the whereabouts of the gunmen at the restaurant and shopping area are unknown. French borders are closed tonight.